NEW YORK (AP) San Diego Padres rookie left-hander Eric Lauer popped out of the dugout for the ninth inning and was greeted by Cake’s ”The Distance” on the PA, as well as the heart of the Los Angeles Dodgers‘ order. Lauer didn’t quite go the distance, coming within one out of his first career complete game before allowing Max Muncy’s home run. Manager Andy Green decided the 115-pitch performance was enough. Kirby Yates came on and struck out All-Star Matt Kemp to seal the Padres’ 4-1 victory Tuesday night. Green said he wanted Lauer to experience the emotion of going out for the ninth. 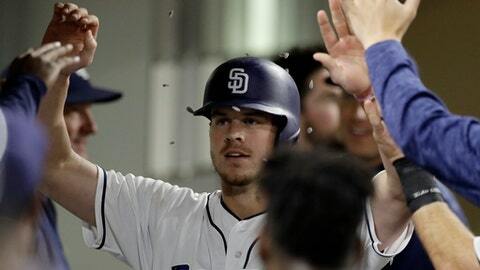 After Muncy’s home run, Green said Lauer at least deserved a conversation before the manager decided that the rookie, backed by home runs by Wil Myers and Austin Hedges, had done enough. ”He knows those feelings. Hopefully those feelings push him the next time he’s out there. One more out to get the next time. Can’t leave that out in front of you. I thought he was great all the way through,” Green said. Lauer (5-5) took a three-hit shutout into the ninth inning after having thrown 101 pitches. He got Enrique Hernandez to fly out to center and Justin Turner to fly out to deep left before Muncy drove a 1-1 pitch into the seats in left, his 21st. Lauer, 23, said almost getting the complete game ranked just behind the no-hitter he threw at Kent State in 2016, just a few weeks before the Padres took with him with the 26th pick overall in the amateur draft. Lauer struck out a career-high eight and walked two in winning consecutive starts for the first time. He also had his ninth pickoff of the season, nabbing Muncy in the second after a leadoff walk. Lauer improved to 2-0 against Los Angeles. ”It’s the Dodgers, man,” he said. ”Nobody likes the Dodgers. You want to get them a little more than any other team. I’ve been fortunate to do good against them so far. Hopefully I can keep it rolling against them,” he said. Myers homered for the sixth time in four games and Hedges had a three-run shot. Myers, who has played in only 28 games this season due to injuries, has heated up after a second stint on the disabled list. He hit three home runs Saturday in a 20-5 loss at Arizona, hit another in the 16th inning on Sunday to give the Padres a 4-3 win over the Diamondbacks, and then homered in the ninth inning of an 8-2 loss to Clayton Kershaw and the Dodgers on Monday night. His homer Tuesday night, to left-center on a 2-1 pitch off Rich Hill, (2-4), was his eighth overall. Hedges hit his fourth of the season earlier in the inning, off the Western Metal Supply Co. brick warehouse in the left field corner at Petco Park on a 1-2 pitch. Jose Pirela drew a leadoff walk and Freddy Galvis singled ahead of Hedges’ homer. Eric Hosmer just missed homering in the third, when center fielder Cody Bellinger leaped to make the catch at the fence. Hill allowed four runs and eight hits in seven innings, struck out seven and walked one. The teams finished the game in a quick 2 hours, 18 minutes. Padres center fielder Manuel Margot made a nice diving catch of Justin Turner’s fly ball in the seventh and then made a sliding catch of Chris Taylor’s sinking liner to end the eighth. Dodgers: RHP Kenta Maeda (5-5, 3.24), the scheduled starter for the third game in the four-game series, is 4-3 with a 4.70 ERA in 10 career starts against San Diego. Padres: Rookie LHP Joey Lucchesi (4-4, 3.27) is 1-1 with a 1.26 ERA in his last three starts.